Isabel Lo is embracing clutter - and is ditching kondo for good. 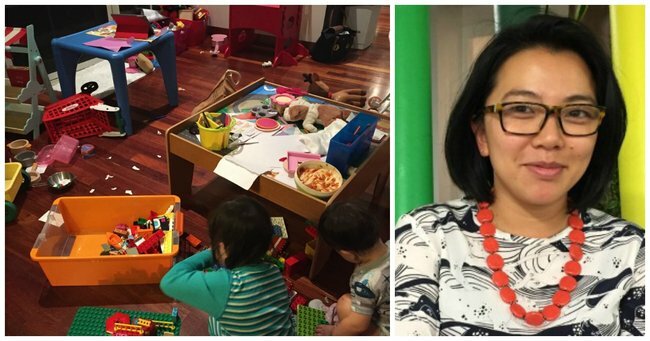 Once a Kondo convert, Isabel Lo is now choosing the untidy life. It’s been almost a year since I paid someone to declutter my house. This morning I opened the wardrobe, and a suitcase packed with a year’s worth of hoisery fell on my head. That resounding thud jolted be back to my current reality: I am back to being surrounded by stuff. It’s crept back into my life, not like an insidious cancerous growth, but more like the cute bedraggled neighbourhood cat scratching at the back door. A familiar, comforting yet not always welcome sight. Indeed everytime I bought an item from the internet, it’s arrival would be announced by the screech of tyres outside my front door, a massive box plonked on the step. Inside that box, would be another box, encased in a mille-feuille of tissues, 10 metres of ribbon, 12 receipts in case I consider returning it… and after much huffing and puffing of uncovering the layers… a teeny tiny 100ml bottle of moisturiser. It’s suffocating. But then I saw my daughter run across the living room screeching in delight. She scrunched up the tissue paper and stuffed it into her dolls bag. The receipts were transformed into ‘work’ papers that she stracks haphazardly in the corner of her ‘work’ space. The reams of scotch tape were re-imagined into bandages for her injured toys. There is poetry in this mess... somewhere. I don&apos;t want to deny her this opportunity to exercise her creative freedom. I call this &apos;Mount Everest&apos;. Where I see a clean, pristine and fresh interior, she sees a room devoid of fun and life. The thing is, the minimalists don&apos;t tell you how much effort is required to maintain a pristine and uncluttered life. It takes a lot of time and energy to roll up endless piles of t shirts, and to sort through the mismatching sock drawer. Part of the anti-clutter backlash includes the fact that it&apos;s largely a middle-class, first-world problem. That the whole minimalist movement is tone-deaf to people who are living on the edge of poverty, and don&apos;t have the liberty to get rid of stuff so freely and easily. I don&apos;t really buy either arguments. I&apos;m firmly middle-class and I&apos;ve been on both ends of the spectrum (from stuff dumper, to stuff appreciator). For me, it boils down to how I want to spend my time. Isabel and her two children. Kondo converts, I am done. I&apos;ve let go of the idea of letting go of stuff... and that&apos;s okay. I am still practicing a Kondo-approved tactic. I am learning to get joy out of every Styrofoam box, every chewed up straw, every scrap piece of paper. All I have to do is close my eyes and pretend they&apos;re fairy wings.